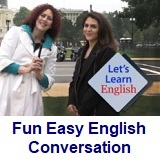 ﻿ Fun Easy English - new classroom free online classes english language lessons speaking listening writing reading january 28. 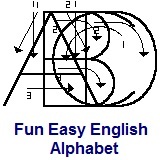 Today in the Fun Easy English classroom you are going to learn the correct way to write the English alphabet letter B in manuscript and cursive. Writing the English alphabet letter B correctly in manuscript and cursive. This letter can sometimes look like the number 8. Be sure to write this letter correctly especially when giving someone your email address or other information containing both the letter B and the number 8. Really practice a lot in order to write perfectly. Conversation Lesson 28 - I Passed It! In this lesson Anna tells her roommate, Marsha, about the problems she had in her driving test. Then Anna says she wants to drive to a special place in Washington, D.C. Where will she drive? Do you know how to drive a car? Were you nervous when you first learned? Write about it in the Facebook Comments section below. Then practice using imperative verbs with a friend. Click lesson activity to get the printable PDF version. The page opens to a new window.